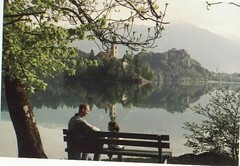 The above photo, taken during our first visit to Slovenia in 2002, is enlarged, framed and hangs in living. We’ve received many positive comments about it and most people who see it thinks it’s a painting. The funny thing is John swears he took the photo and I really believe I took it. We shared the camera throughout the vacation and were taking lots of photos. It easily could have been either one of us. 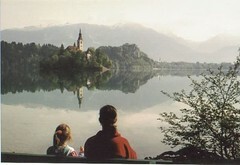 We walked around Lake Bled early in the morning which was so still and beautiful. What do you think ~ should I go ahead and give him the credit? Patti – Joe and I have a picture that we argue over too! My opinion on this is: If he can “Feel it in his Bones” give him the credit – know in your heart that you are responsible. Beautiful ! You are all so fortunate to have so many travel adventures. Keep showing the world to your visitors. I remember you telling me how much you guys enjoyed Slovenia… and didn’t you mention a Lush store as well? 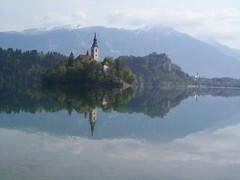 Looking at the pics really makes me want to go there… might ask you for recommendations on places to stay etc. once we are back in Germany. Thanks for sharing the wonderful pics! That is a beautiful shot! Photography has always been one of those things I’ve wished to be good at but it’s hit and miss. I have one photo from our time in Germany that I love and it was really an accident….and the many scenes that I tried so hard to capture…well…not so good! Keep sharing your wonderful pics! I think it was FG . . . she really does take pretty good photos! I can so hear you two ‘discussing’ this photo. I must admit it was a beautiful place and so glad you took me. I was just thinking abou that trip last night . . . how it was the first real trip I took without Sean . . . I remember not being able to sleep since I was all alone in the room . . . sort of hard to swallow but the days were so much fun!